These are the steps you may use to reset your password when you have forgotten it, when your password isn’t working, or if you want to change your password. Remember that any new passwords must meet all the password requirements. IMPORTANT NOTE: You have to configure your profile while you have access your account. 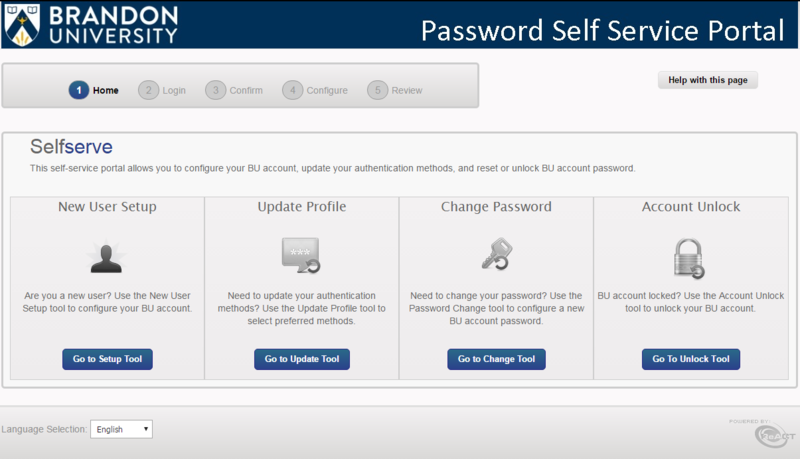 Once you have configured your profile, then you may begin using the tool to reset or change your password. Choose the “Go to Change Tool” as in the image above. Then there are up to 4 choices you can use in order to reset your password. Click Continue once you have entered your information for your selected option. Once completed you are presented with the option to enter your new password. Your new password must follow the password complexity requirements that are listed under “Password Rules”. After entering a new password that satisfies the Password Rules you can click “Reset”. The system will then process the password reset request and will report back if it was successful. If you get a failure during any part of the reset process please contact the Brandon University Help Desk. There is an application available for your Windows Computer that will allow you to Reset or Change your password without having to log into your computer. This very helpful if you have forgotten your password and you are unable to sign into your computer. 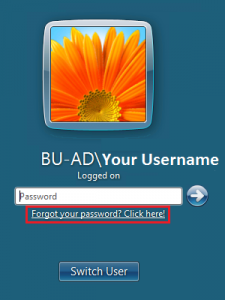 The application simply adds a “Forgot Your Password” option on the login screen, which you can click, if you have forgotten your password (shown in image below). Contact the Brandon University Help Desk to have this application installed on your Windows Computer.